Massachusetts has a strong manufacturing industry, ranked 15th in a recent comparison by StateMaster.com. With this level of manufacturing, a lot of metalworking equipment trades hands. But when it comes to selling metalworking equipment in Massachusetts, there are many options available. Online auctions help you sell your Massachusetts metalworking equipment across a wider geographical area with more options available. What is Manufactured in Massachusetts? 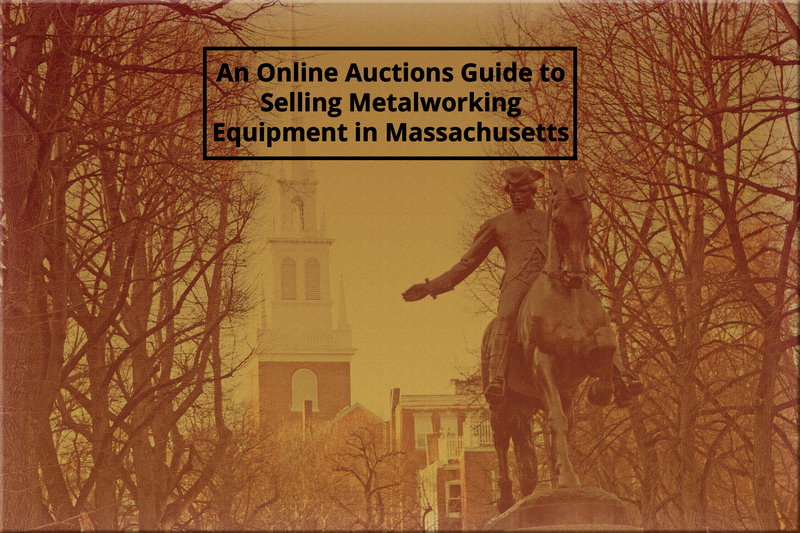 What Metalworking Equipment Is Best for Selling In An Online Auction In Massachusetts? 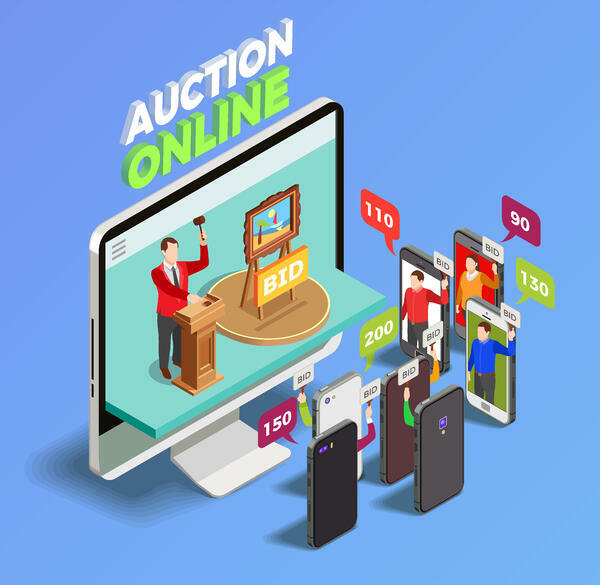 What are the Differences Between Online and On-site Auctions? Also referred to as the Bay State Massachusetts has a long and rich history of manufacturing going back centuries. Before being known for manufacturing sports championships in record numbers, the state has it hands in many different types of manufacturing with the top 3 manufacturing industries being computer and electronic manufacturing, chemical product manufacturing, and fabricated metal products. These industries also have seen continued growth year after year recording steady growth in manufacturing from 2009 to present. With that steady growth many businesses have selected Massachusetts to be home, some of these manufacturers include companies like Hyde Tools who produce various hardware tools manufactured from metal. Perhaps an over looked product in many urban centers is the creation of horseshoes, for both agricultural use as well as the recreational game. Massachusetts is also home to St. Pierre Manufacturing Corp who have been manufacturing horseshoes since 1938. However, the need for metalworking equipment does not stop at larger production pieces like hand tools and horseshoes. Massachusetts is also home to many Laser cutting metal fabrication shops and silver working companies with equipment that is highly precise in its tasks. If none of the above interests, you Massachusetts is also home to something a little more musical. Zildjian Cymbals have recently celebrated their 350th anniversary as a company, being in Massachusetts since 1929. This company is known worldwide for producing high-quality percussion instrument cymbals. 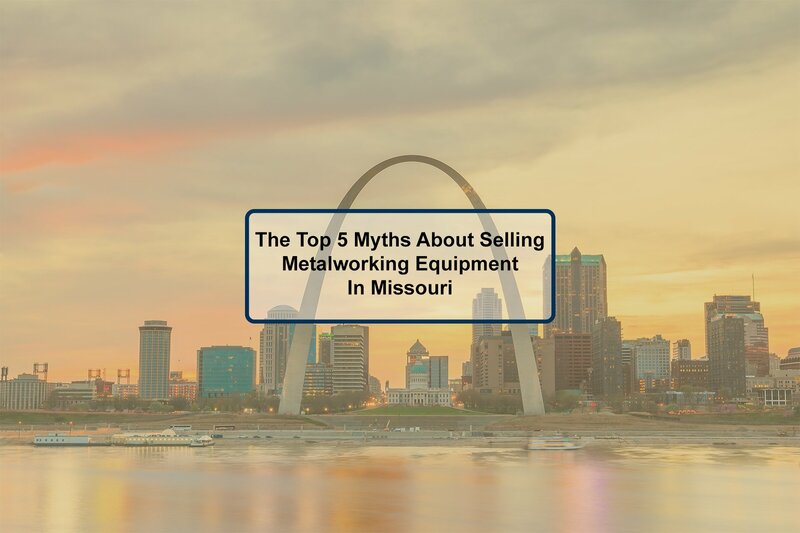 The list doesn’t stop with just medium sizes businesses that rely heavily on metalworking equipment. Massachusetts is also home to several Fortune 500 companies that use the same metalworking equipment. These companies include, General Electric, Raytheon, Thermo Fisher Scientific, and many more. Due to the variety of manufacturing businesses across the commonwealth of Massachusetts this prevents one type of machinery from being in particularly high demand. 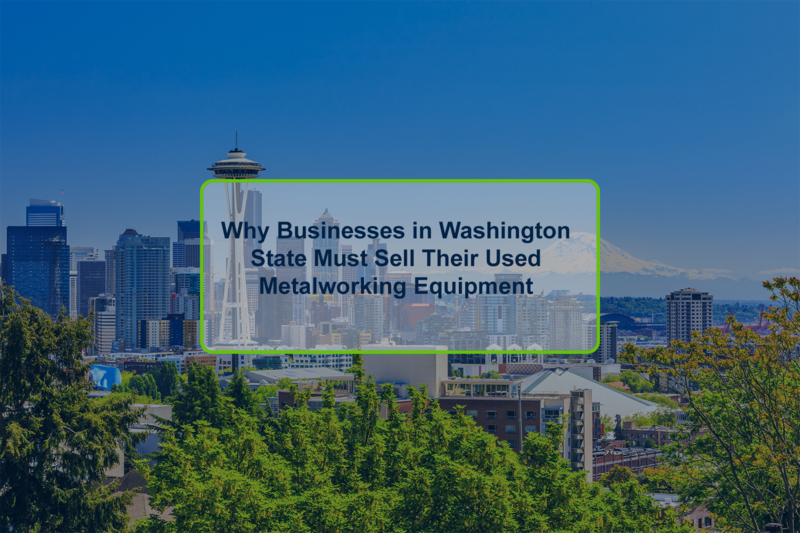 However, there are some common pieces of equipment that tend to fetch more when you are selling your metalworking equipment in Massachusetts. Some of the more common pieces of equipment seen up for auction in Massachusetts are pipe benders of both the manual and hydraulic type. At first one may believe because this item is commonly listed on online industrial auction websites this means the market may be oversaturated, however this could show how desirable the item is when for auction. For faster liquidation of this item setting a lower reserve price may quickly incite a bidding war. 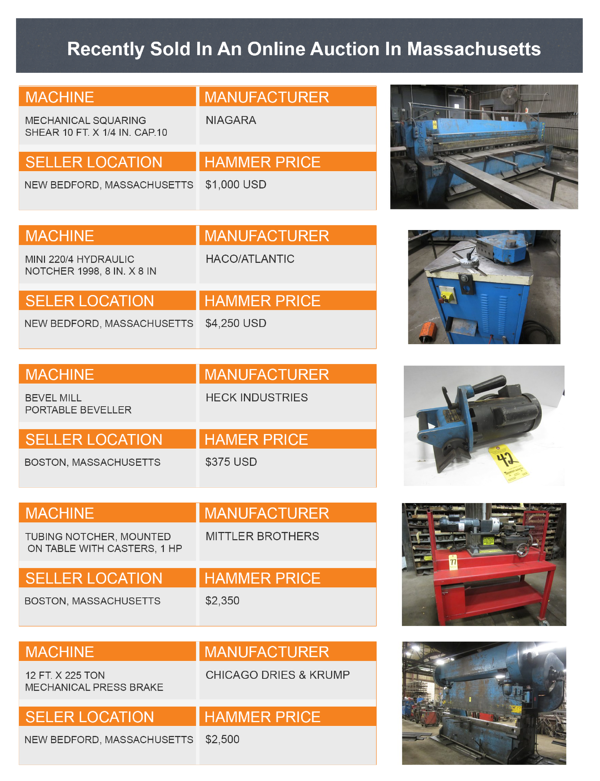 Other common items in online industrial auctions in Massachusetts include lathes, presses, CNC & milling machines. For centuries, on-site auctions were about the only way to conduct a sale where whatever items were for sale could be quickly sold by presenting them to many people who would bid what they felt was fair for the item. However, this created some issues when selling equipment. If it was specialized machinery, there may not be enough interested parties in the region to create competition, so the equipment may not have fetched what it was worth. If the industry was in a slump in that region, nobody may have been purchasing the equipment, because there was already a surplus on the market. The only other options were to advertise the auction for months in advance in a wider region and hope that interested buyers would be willing to come from a further distance to purchase machinery. However, the advent of the digital age changed this practice. Suddenly, rather than being restricted to a regional group of sellers, you could reach out internationally to a much wider audience, including regions where the market was in significantly better shape and to buyers who work with your specific type of equipment. This helps build competition between buyers and increase your profitability by using online auctions. Though eBay started as the first online auction, general auction sites such as this tend to allow your machinery to be lost in the crowd. For that reason, we recommend that you work with an online auction site that is devoted to machinery to ensure that you're getting the right people bidding on your equipment. Part of the process of getting good returns on your online auction when selling metalworking equipment in Massachusetts involves taking a little bit of time to prepare your equipment for sale. When you're selling used industrial machinery, that equipment may be in service for many years, requiring a bit of work to make it look its best before you list it for sale on an online auction site. Is the metalworking equipment stationary? If it is, blow it off with an air compressor or wipe it down to remove any dust or production debris. Take a few minutes to clean up the area around the machinery as well and consider adding a backdrop if the background of the equipment is very busy. If the machinery is mobile, you have the option of moving it to a better location for photographs and video once you've given it a solid wash down. If there are any minor defects or needed repairs, you'll want to take care of them to improve the chances of it selling at a good profit. Replacing parts that receive a great deal of wear, such as belts, tires, hoses or seats can help you recover more value in the auction process. You're not going for perfection, but good condition. Next, you'll want to look at the paperwork for the equipment. If you're selling a vehicle or larger piece of equipment that has a title, you'll want to make sure that the title is free and clear, and that any liens or loans have been taken care of so that ownership may be transferred easily. Take a few minutes to organize the service records, updating them if necessary, to show that the equipment has been well maintained. By getting these items in order now, it will be much easier to locate them when a potential bidder has a question or wants to see this documentation. Consider gathering all the information into a file folder, binder or accordion folder to pass on to the client once the machinery is sold. If a picture is worth 1,000 words, having great pictures can help sell your equipment, while poor-quality pictures may prevent a sale from taking place. You don't need professional-grade equipment or perfect layouts to get good photos for your auction. Use bright, natural light to get sharp, clear photos. If possible, take your photos near a window with natural light or outside. You can also use your camera's or photo editing software's white balance setting to adjust the light settings. A simple trick that many artists use is to hold a piece of white paper up at the bottom of the photo, then crop it out later, which provides an automatic light balance. Simplify your background. When the background of your photo is cluttered and chaotic, it can be hard for customers to determine exactly what's included and what is and is not part of the equipment. If possible, stage your equipment in front of a plain white wall or hang a white sheet behind it to get a clean background. Don't forget to clean up the floor! Steady the frame. If you have issues with getting clear photos, it may be that the camera is shaking when you push the shutter button. Consider using a tripod, holding the camera strap tight against the back of your neck or bracing yourself on a solid object to eliminate the motion of the camera, then squeeze the shutter button gently rather than pushing it. Get pictures of manufacturer's tags. These engraved or printed tags are included on most machinery and include the manufacturer, model and technical specifications of that piece of equipment. By including a photo of this tag, you'll save a lot of questions as prospective bidders will already have the information they need. Make sure this photo is very clear and think about using a macro setting. Get shots from every angle. In addition to shooting pictures of what the bidder may be in, get shots from every angle so they can determine on their own the condition of particular parts or whether the frame is straight. This helps to reduce the number of questions you'll have to answer while making it easier for prospective bidders to make their own judgment calls. Go high-res. When you're shooting photos of your equipment, use a medium setting on a camera so that the viewer can pull up the photo and zoom in to see all the details they need to make an educated decision. On a higher-resolution camera (over 15 megapixels), look at using a medium setting to avoid long download times and viewer frustration. Don't forget the bad parts! You've got a responsibility as a seller to honestly represent the condition of the equipment, including any flaws. This allows the buyer to know exactly what to expect and avoids problems with bad feedback. If there's an obvious blemish, take a picture of it and include it in the listing. Learn the basics of photo editing. A few simple tricks, such as adjusting white balance or cropping out background items can help quickly improve your photos, allowing you to avoid having to re-take photos that weren't quite right. However, only edit photos to enhance quality, not the machinery you're selling, as it will need to look like it does. 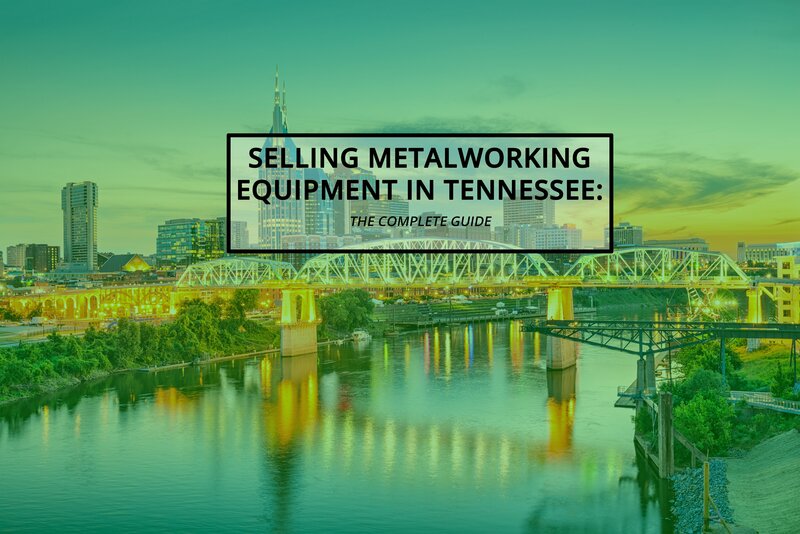 Now that you have selected your equipment for Auction and photographed it appropriately you need to correctly market each piece, so you have maximized the return on the sale, but the question becomes how can I market my metalworking equipment in Massachusetts? 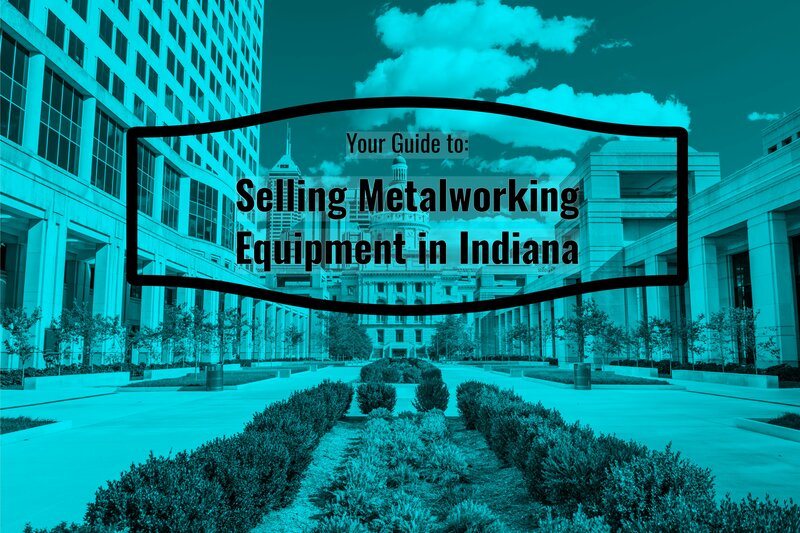 Here are the most common ways to market your auction for industrial equipment. Telemarketing – Telemarketing is one of the older forms of marketing but can be still successfully used today. However, you must be fully prepared for telemarketing. You will need a list of contacts to successfully call. Having a script prepared may seem easier but will appear fake and robotic to any callers. The best method for telemarketing is to simply engage in a conversation and provide information about your equipment naturally and organically. Pay-Per-Click (PPC) – As more people spend more time searching online for whatever they desire PPC is a great way to attract new people to your auction without ever being previously introduced to your business. With PPC advertisements you pay for targeted listing on search engines such as Google and Bing. While a great way to potentially attract buyers, this method could be costly if you have limited experience in this area. Social Media – Social media may be the most organic method of advertising to reach your target audience. This involves creating and scheduling posts to various social media channels such as Facebook, LinkedIn, Twitter, Instagram and many more. With massive amounts of potential buyers on each platform the trick is to have consistent and targeted messaging on each platform so your posts will display for those most likely to bid on your metalworking equipment. 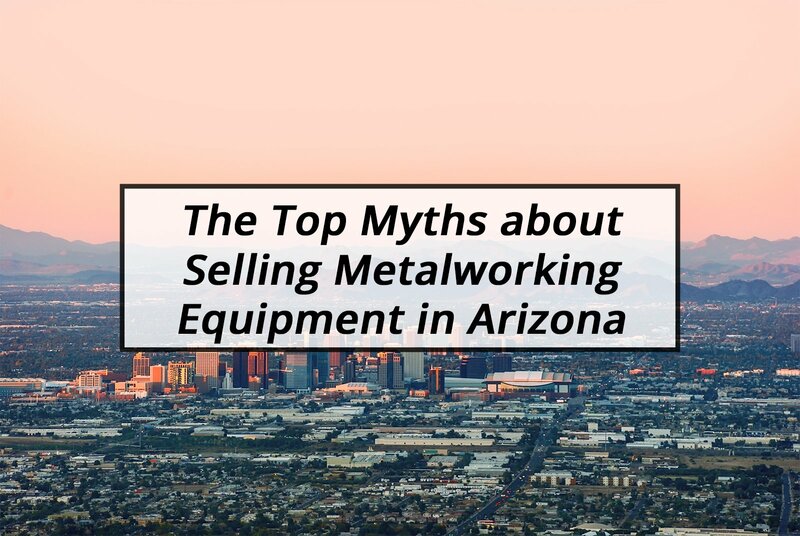 While most other online auctions platforms do not have native marketing and advertising features for metalworking equipment being sold on the website this is where Aucto shines. We want to help our sellers maximize return on all equipment sold and help our buyers find the best equipment possible, because of this we actively engage in many forms of advertising on all our lots including the methods mentioned above. This is one of the many Aucto differences. When selling metalworking equipment in Massachusetts, you have options to help move that machinery, but Aucto is one of the best sites available. With Aucto, the selling process is always free, and we charge one of the lowest brokerage fees to buyers in the industry. We also provide you with a wide range of sales tools to ensure your used equipment is able to find a new home. Have a question about buying used industrial equipment or selling used industrial equipment online? Give Aucto a call at 1 (844) 326-7339 or email at sellers@aucto.com, and our team of experienced online auctioneers and customer support team will be more than happy to answer them. Like this article? Check out some of our recent articles: Buying Used Material Handling Equipment in Auctions – A Guide for Buyers, The Pros & Cons of Buying Used Industrial Equipment Online, and Buying in Industrial Auctions: Insider Tips for Your First Used Equipment Auction.